We’d love your help. Let us know what’s wrong with this preview of Engendering Judaism by Rachel Adler. Winner of the National Jewish Book Award for 1998. How can women's full participation transform Jewish law, prayer, sexuality, and marriage? What does it mean to "engender" Jewish tradition? 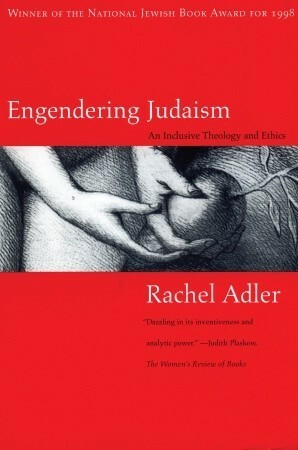 Pioneering theologian Rachel Adler gives this timely and powerful question its first thorough study in a book that bristles with humor, passion, intelligence, and deep knowledge of tra Winner of the National Jewish Book Award for 1998. To ask other readers questions about Engendering Judaism, please sign up. Before reading this, I had heard it described as "radical." I think that adjective is too leading. While Adler is radical, she is not necessarily so in the ways you might expect. The book is 20 years old, and though some of its ideas have percolated downwards, they have not done so evenly. What distinguishes Adler's work is the depth of her analysis. Many Jewish feminists focus on inequality in ritual life: the ability to learn Torah, to lead a service, to count in the minyan. Adler is intereste Before reading this, I had heard it described as "radical." I think that adjective is too leading. While Adler is radical, she is not necessarily so in the ways you might expect. The book is 20 years old, and though some of its ideas have percolated downwards, they have not done so evenly. What distinguishes Adler's work is the depth of her analysis. Many Jewish feminists focus on inequality in ritual life: the ability to learn Torah, to lead a service, to count in the minyan. Adler is interested in what lies beyond that--the fundamental sexism in our texts and traditions. What stories do they tell? Whose voices are heard? Who has constructed the halakha that governs the life we lead every day? The answer is men. And that leads to the second question: How are we to incorporate the voices and desires of women? Adler focuses in depth on several areas: the construction of halakha, the liturgy, and sexuality. The work of engendering Judaism requires us to balance the needs of feminism and equality with respect for the power of tradition. This is particularly important in the discussion of liturgy. The power of performance, of ritual, of stating centuries old formulae are real. Some attempts to rewrite tradition have failed because people have refused to accept them. At the same time, we need to consider the language and imagery we use. How does it shape our view of the Divine to pray in ways that are so essentially masculine? What feminine language should we use, and when should it be gender neutral? Adler doesn't answer all these questions, but she pushes the reader to think about them. In her final chapter, she uses marriage as a test case of composing a new, egalitarian tradition for marriage--that of "brit ahuvim", the covenant of the beloved: a coalition of equals, to replace the acquisition based ritual of traditional Jewish marriage. While this will not appeal to all people for various reasons, it's a good way to illustrate her points. One of the seminal books of Jewish feminism (first published in the 1990s, I believe). Lots of fascinating stuff in here, including a new approach to kiddushin, & a text to use instead of a ketubah, for both straight & gay couples. A groundbreaking book that opened a new era in thought about women and halakhah, Jewish law. Dr. Adler argues for a feminist reading of Jewish legal questions and explores the possibilities, including a new covenant of marriage, the brit ahuvim. This book does a very good job of identifying the problematic aspects of the roles of women in the Torah and in traditional Judaism. In some instances (like the chapter on inclusive language in worship) it is better at identifying the problems with making the necessary reforms than with proposing said reforms. However, the chapter on marriage does an excellent job of proposing a system that transforms marriage from ownership to partnership-- and in such a way to benefit both heterosexual and hom This book does a very good job of identifying the problematic aspects of the roles of women in the Torah and in traditional Judaism. In some instances (like the chapter on inclusive language in worship) it is better at identifying the problems with making the necessary reforms than with proposing said reforms. However, the chapter on marriage does an excellent job of proposing a system that transforms marriage from ownership to partnership-- and in such a way to benefit both heterosexual and homosexual couples (pretty good for a book written in 1998). I went into this book looking for proof that Judaism isn't as sexist as I was taught and this couldn't do that, because, well, it is that problematic. But it does a very good job of giving name and voice to the problem, of validating my feelings of isolation (and naming the ones I probably recognized subconsciously but not consciously, such as the use of male gendered Hebrew words with reference to G-d* as well as male imagery), and attacked them, head on, with other traditional sources. You kind of have to come at things sideways, but when you realize that the Torah and the accompanying bodies of Jewish law are products of their time as well as divinely inspired, you begin to wonder if G-d* was planting the seeds for these reforms when we, as a society, became mature enough to begin to look for them. I read excerpts of this book for a course on Women in Jewish Law, and had to go back and read the whole thing because I liked it so much. Chapter 4, "Justice & Peace Shall Kiss: An Ethics of Sexuality and Relationship" is especially interesting to those studying religion and gender/ sexuality as a whole; I found it applicable to a wide range of subjects outside of Judaism. And of course, Chapter 2, "Here Comes Skotsl", is required reading for everyone interested in feminist Jewish theology.